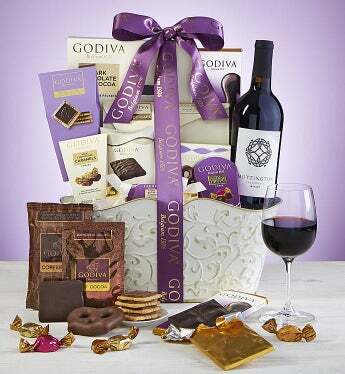 An elegantly embossed gift basket filled with a luxurious assortment of Godiva® Chocolate Treats and delicious Merlot Wine. The ideal gift for any Spring occasion. Chocolate lovers will appreciate the splendid selection including Godiva® Chocolate, Godiva® Dark Truffle Biscuits, Godiva® Chocolate Covered Pretzels and more!